Having seen the ways that people can come together in a crisis in the uplifting Come From Away last week, this week brought a more anarchic and nihilistic view of post-9/11 America from American Idiot, the rock opera based on the Green Day concept album of the same name. Celebrating its 10th anniversary, the musical feels at once relevant while also capturing a very specific period of history as experienced by a generation of disenfranchised youths. Director Racky Plews takes a surreal and scattergun approach to Billie Joe Armstrong and Michael Mayer’s creation which I found critically and personally confounding. Against a backdrop of political turmoil, media propaganda and suburban, Americana-tinted ennui, three friends find themselves in the midst of a philosophical identity crisis. Getting drunk, getting high and watching tv are the sole activities available to them in their small hometown. Escape manifests in the form of a ‘Holiday’ to the big city, but duty, addiction and love push the trio to the limits of sanity. Tunny is coerced by the televised image of the stereotypical ‘Favorite Son’ and enlists in the army. Johnny (Tom Milner) is torn between a burgeoning relationship and an addiction flamed by a nefarious manifestation of his psyche, the erratic and uncompromising drug dealer, St Jimmy (Luke Friend). Meanwhile, their friend Will (Samuel Pope) suffers from extreme FOMO as his pregnant girlfriend becomes increasingly sick of his immaturity. Mix in some classic punk hits and you’ve got the recipe for a riotous dissection of post-terror Western zeitgeist, right? It seems contradictory to suggest that Plews’ production could do with more polish, but occasionally the piece seems to fall on the wrong side of erratic. In fact, this may be more the fault of the book (by Armstrong and Mayer), which attempts to cram an awful lot into a short space of time (in this production, two hours including an interval); for example, one short scene takes us through a relationship breakdown, a metaphorical suicide, the procurement of and resignation from a nine to five clerical job, and a reunion with hometown faces. The absurdity in this lies with the fact that the musical is fundamentally about stasis; about a demonised generation of millennial wasters created by a socio-political system of capitalism, bigotry and propaganda. Whether satirically intentional or not, most of the characters are traced lightly, as befits the consumerist taste for simple, mindless entertainment – personal complexities buried in favour of an unhinged inspection of national identity. The nihilistic inevitability of the show and our trio of chums ending up exactly where they were at the beginning is slyly audacious in its realism. And this is why I am utterly beguiled by American Idiot – it features a plot where everything and nothing happens, the audience are fed bit-sized morsels of angsty, yet melodic, rhapsodising which ultimately don’t amount to anything – we’re back where we started, with Johnny reliving his failed relationship with Whatshername, a girl he can barely remember (Sam Lavery) – everything is fundamentally expendable whether we like it or not. Yet, perhaps we feel the frustration of the characters a little more keenly than before. In a feat of paradoxical genius (for what else can I call it? ), Armstrong and Mayer have created a mood piece which reflects our own dissatisfaction back at us.Perhaps I’m overanalysing. The music, as you’d expect, is full of thumping crowd-pleasing tunes, sung with gusto by a cast that get stuck into grunge life. Highlights include the titular opening number (an anthem of our time, surely, Mr President? ), the antithetical love-ballad ‘Give Me Novacaine’, and the yearning triptych arrangement of ‘Wake Me Up When September Ends’. Sara Perk’s set places us in a dystopian, post-apocalyptic 21st Century America, which playfully complements the use of screen graphics of rictus-grinned broadcasters. On a personal note, American Idiot indulged a nostalgia I didn’t even know I craved. There was a time when I wouldn’t have felt dissimilar to Johnny and co. during my disillusioned, misspent youth (underspent, overspent – however you want to put it), yet it also brought back fond memories of my younger brother buying the original album and making everyone listen to it on repeat. I vividly recall how he used to dress up as Billie Joe Armstrong and get me to apply his eyeliner for him (he doesn’t read this blog, so no embarrassment caused!). Oh to be young and carefree! American Idiot is more than ‘just’ a jukebox musical (a derogatory term which is unwarranted by most, in my opinion). It captures the mood of those early days of the 21st century, when the world portrayed to us by the media seemed to be a playground of progressive, exciting action, yet fell short for so many. 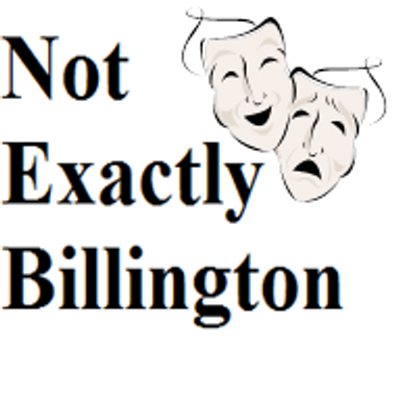 Launched in 2012, Not Exactly Billington is a Leicester-based theatre blog run by Adam and Jasmine, who are keen to explore and promote the arts on a national scale while maintaining the importance of regional voices, perspectives and creative endeavours. The couple share blogging responsibilities and often collaborate on reviews, thus giving a broader response. For three years, they also successfully ran the #ReadaPlayaWeek initiative. Each week, they championed a different play, ensuring there was equal representation of male and female writers as part of their advocacy for gender equity and diversity in the arts. They tweet at @NoBillington.